Slovakian automotive production is set to grow further in 2018. While profits are expected to remain stable in 2018, an increase in labour cost cannot be ruled out due the low unemployment rate and labour shortage. Competition and price pressure remain high. Financing requirements and gearing of businesses are average in this sector. Many Tier 1 suppliers have significant equity and their working capital financing is rather low, as they deliver just in time. 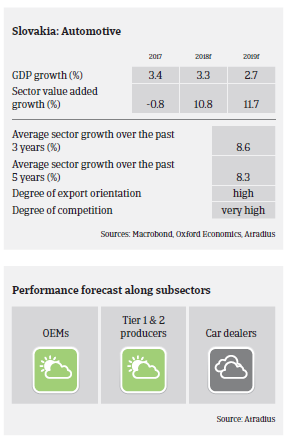 While Tier 2 suppliers are generally more indebted as they require higher stock levels, banks are willing to provide loans to this segment and to automotive businesses in general. Payment duration in the automotive sector ranges from 45 to 90 days. Payment experience has been good over the past two years. The level of non-payments and insolvencies is low, and this is expected to remain unchanged in the coming months. Our underwriting stance remains open for this industry, especially for OEMs and Tier 1 businesses, and neutral for Tier 2 companies and car dealers. While the threat of US punitive tariffs on car and car part imports from the EU has been averted for the time being, any future imposition would immediately hurt the strongly export-oriented Slovakian automotive industry. This would mainly affect the turnover and margins of one large OEM that exports directly to the US and related suppliers. It would also increase the credit risk of businesses along the value chain. The percentage of overdue B2B invoices in Slovakia decreased from 48.0% in 2016 to 41.5% this year. This is in line with the regional average (41.5%).